Recently the National Highway Traffic Safety Administration (NHTSA) handed down a landmark rule that addresses the ongoing debate of seat belt use on school buses. Among other changes, the rule requires an increase in the seatback height on both large and small school buses and mandates the installation of three-point seat belts on smaller buses. The school bus industry has embraced these new school bus safety standards, and lauds them for further improving the safest mode of student transportation. As the largest school bus transportation provider in North America, First Student commends NHTSA for taking action to offer this added degree of protection for the 25 million children who ride in school buses every day. Beginning October 2009 all new school buses must be equipped with 24-inch-high seat backs, an increase from the current 20-inch-high seat backs. Beginning October 2011 all new, smaller school buses (10,000 pounds or less) must be equipped with three-point seat belts that use both lap and shoulder restraints. Performance standards for districts should they decide to install seat belts on larger buses. While today’s school bus is engineered for safety, the increased seat back height marks a significant extra measure. The school bus industry proposed higher seat backs as early as 2005 in a resolution the National Congress on School Transportation adopted. The higher seat backs design better protects taller children such as middle and high school students. The extra four inches required in the NHTSA regulation prevents these students from overriding the top of the seat in a frontal crash, keeping them safe in the seating compartment. Unlike a passenger car, the body of a large school bus absorbs the energy of an impact, making compartmentalization the safest passenger protection system. 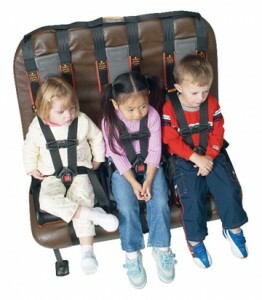 This type of restraint works well for large school buses because, in addition to external safety factors such as the height and weight of the bus itself, highly engineered seating compartments where any residual force of a crash is absorbed by padded seat backs rather than by their bodies keep children safe. Seven states have already made higher seat backs a requirement. Bus manufacturers IC Bus and ThomasBuilt have made higher seat back buses available for many years and are gearing up to meet the seat back height requirements to comply with the timing of the new standard. Lap and shoulder belts are a beneficial safety enhancement for smaller buses. While still designed for safety smaller buses do not have some of the exterior advantages that larger buses enjoy. The NHTSA mandate for three-point shoulder/lap belts on smaller school buses is already a safety feature in place in some of the school districts First Student serves. For preschool programs that require transporting young children, First Student also works with its customers to provide car seats or other safety restraint systems as an added safety measure. Even though school buses are the safest, most technologically advanced they have ever been, without properly trained professional drivers, the responsibility of this company to the communities it serves would certainly go unmet. We can never overstate the value of good training and hiring the best employees. It is critical that as an industry we constantly seek out and effectively equip drivers with the best safety training as well as the defensive driving techniques they need to avoid accidents altogether as much as possible. As the largest school bus contractor and as a provider of other transit services, FirstGroup America is constantly looking for ways to ensure the highest level of safety for all of its passengers. Regular re-examination of school bus safety standards and the introduction of new safety regulations by NHTSA and other agencies are always welcome. The school bus plays an important role in the education of America’s children. For many, it is their only means of getting to and from school and therefore often their only access to education. First Student is committed to working with government agencies, industry organizations, bus manufacturers, school districts and the communities we serve to ensure the safe transport of children to and from school. Mike Murray is President and CEO of FirstGroup America, North America’s largest transportation provider. FirstGroup America is the recipient of the National Safety Council’s Green Cross for Safety Medal, in recognition of its strong safety culture, commitment to its core values of safety and customer service, and its outstanding safety record. First Student, Inc., is part of FirstGroup America and is the largest provider of student transportation, safely transporting more than 3 million students in the U.S. each day. For more information, please visit www.firststudentinc.com.